Treat your near and dear ones in an exclusive way with this Wonderful All Time Favourite Diwali Hamper and make them feel very special. 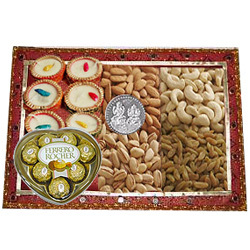 This unique Diwali special Gift Tray will bring a real wow effect as it is beautifully arranged with Ferrero Rocher Chocolate Box of 8 pc, Dry Fruits pack of Gross Weight 250 Gr., Decorative Diyas 6 pc. and a Free Silver Plated Lakshmi Ganesh Coin. Flowers Delivery Srikalhasti, Send sweets Erode, Wedding Cake Tumkur, Diwali Mithai Bangalore, Send Flowers and Gifts to Shillong, Online Shop Miraz, Flower to Sahranpur, New Year Flowers Mumbai , Fresh Fruits Bharuch, Send Gift Gandhinagar, Dry Fruits to Gadag, Birthday Delivery Jhalawar, Sending to Roorkee, Flower shop Chandigarh, Roorkee Online Cake Delivery.